1 of 2. Traders are pictured at their desks in front of the DAX board at the Frankfurt stock exchange September 14, 2012. TOKYO (Reuters) - Asian shares were pressured on Wednesday with investors searching for fresh catalysts such as the Bank of Japan's policy meeting which ends later in the day, while a sharp boost to asset prices inspired by the U.S. Federal Reserve has given way to worries about Spain's fiscal strains. MSCI's broadest index of Asia-Pacific shares outside Japan .MIAPJ0000PUS was down 0.1 percent, with Australian shares .AXJO down 0.1 percent, while South Korean shares .KS11 eased 0.3 percent. U.S. stocks ended flat to slightly lower while European shares fell on Tuesday as Spain continued to avoid making decisions on whether to seek an European Union bailout which is conditional for the European Central Bank to start buying the country's bonds to tame its borrowing costs. "All positive catalysts that could have been expected are already out on the table, and the market is again seen holding its current level," said Won Sang-pil, an analyst at Tong Yang Securities. Views were mixed about whether the BOJ will follow its peers overseas with action, after the Fed launched a third round of bond buying known as quantitative easing (QE) last week and the ECB earlier this month outlined its bond-buying scheme to ease fiscal strains for euro zone countries seeking assistance. Some in the markets speculate the BOJ might announce fresh steps to avoid a plunge in Japanese shares and the yen's appreciation ahead of the September 30 fiscal-half. Trade with China was certain to be hit hard by the violent anti-Japanese protest escalating over a territorial dispute, at a time Chinese power transition is taking place, analysts said. "Along with the Chinese factor, the Nikkei faces downside risks as global equities look vulnerable to adjustments from the post-Fed rally, and it's possible for the BOJ to pre-emptively step in to bolster sentiment ahead of the fiscal half, where the level of stock prices is crucial for companies," said Yuji Saito, director of foreign exchange at Credit Agricole in Tokyo. "Many domestic players think the BOJ will stand pat and wait until October, while foreign players see some BOJ move today," Saito said, adding that no action could push the dollar down to 78 yen or briefly below 78 where stop orders were lined up. Concerns over the territorial conflict and damage to trade with China will limit the downside for the dollar/yen, he said. The dollar inched down 0.1 percent to 78.72 yen. The euro steadied around $1.3047. U.S. Treasury bond prices rose on Wednesday on bargain hunting from last week's sharp sell-off and renewed bids for safe-haven assets, as concerns grow over global growth slowdown and while Spanish yields stayed under upward pressures on the uncertain outlook for Spain's fiscal woes. Commodities slumped on Tuesday for a second day as the fragile U.S. economy and economic deteriorations in Europe darkened demand prospects for industrial commodities such as oil and metals, where prices had spiked up on central bank stimulus. The president of the Chicago Fed, Charles Evans, and New York Fed President William Dudley said on Tuesday the U.S. central bank could still do more in an effort to reduce U.S. unemployment even if efforts result in slightly higher inflation. Oil futures were mixed early on Wednesday, with U.S. crude up 0.2 percent at 95.51 a barrel and Brent crude down 0.3 percent at $111.74. Sentiment was cautious in Asian credit markets, with the spread on the iTraxx Asia ex-Japan investment-grade index widening by 2 basis points, but still near a 14-month low. TOKYO â" In an abrupt turnabout, the Japanese government on Wednesday stopped short of formally adopting a goal it announced just last week to phase out nuclear power by 2040. The reversal came after intense opposition to the plan from business groups and communities that host the countryâs nuclear power plants, which have warned that abandoning nuclear power will damage Japanâs economy. Prime Minister Yoshihiko Nodaâs cabinet instead endorsed a vague promise to âengage in debate with local governments and international society and to gain public understandingâ in deciding Japanâs economic future in the wake of the 2011 nuclear disaster at Fukushima. The cabinet on Wednesday said only that it would âtake into considerationâ the goal to eliminate nuclear power by 2040, laid down in a policy document released last week. That document, dubbed the âRevolutionary Energy and Environment Strategy,â says Japan will seek to eliminate nuclear power through greater reliance on renewable energy, conservation and use of fossil fuels. Japan will craft its post-Fukushima energy policy âwith flexibility, based on tireless verification and re-examination,â the cabinetâs resolution read. Nuclear critics called the government indecisive and weak-kneed. âWeâve only seen the government strike compromise after compromise with the business community,â said Hideyuki Ban, secretary-general of a nuclear watchdog, the Citizensâ Nuclear Information Center. National Strategy Minister Motohisa Furukawa, who announced the original strategy last week, defended the cabinetâs omission of the 2040 deadline, saying the government still intended to use the goal as a reference point. âIt is just a matter of decision-making, and there is no real change to content,â he said. But to critics, the cabinetâs failure to officially adopt the 2040 deadline cast into further doubt Japanâs commitment to ending its nuclear power program, first made by Naoto Kan, then the prime minister, in July 2011 as the Fukushima nuclear disaster raged. The announcement last week that Japan would seek to end nuclear power by 2040 had appeared to mark a break from the past, although the target year was later than had been expected and the plan contained loopholes that could keep nuclear power going well beyond that deadline. Japan got about 30 percent of its electricity from 54 reactors across the country before the powerful tsunami in March 2011 triggered multiple meltdowns at the Fukushima Daiichi Nuclear Power Plant and led to a massive radiation leak. The government had planned to eventually raise Japanâs nuclear dependence to 50 percent. Mr. Noda was forced to consider a non-nuclear option after a series of public hearings held by the government showed overwhelming support for a phasing-out within two decades, as well as crippling mistrust of the governmentâs ability to oversee nuclear safety after the Fukushima accident. A nascent anti-nuclear movement also opposes plans to restart the countryâs 50 remaining reactors, all but two of which remain closed in the wake of Fukushima. But business groups had criticized the idea of moving away from nuclear power as impractical and a death knell for Japanese manufacturers, which in recent years have already lost much of their competitive edge to cheaper rivals in Asia. On Tuesday, the chairmen of Japanâs most prominent business associations, including the influential Keidanren, called a rare joint news conference to call on Mr. Noda to abandon the 2040 goal. On Wednesday, they praised the governmentâs decision to mothball it. The no-nuclear-power goal had also worried communities across Japan that host nuclear facilities, which feared losing government subsidies, tax revenues and jobs. They also worry that they will become the final dumping ground for spent nuclear fuel stored at their plants. The governmentâs backtracking came as it officially launched a new agency to oversee the nuclear industry on Wednesday in a bid to regain the publicâs trust. Japan scrapped its previous nuclear regulator following criticism that it had long been drawn into a cozy, collusive relationship with plant operators and had failed to take the necessary steps to prevent a disaster like Fukushima. But that plan has already come under fire, with criticism focusing on Shunichi Tanaka, the head of a five-person committee that would set nuclear policy and retain oversight over the new agency. The government will help create âthe highest-level regulations and disaster-preparedness plans in the world,â Mr. Edano said. TOKYO (AP) â" Japan's Cabinet on Wednesday stopped short of committing to phase out nuclear power by 2040, backtracking from an advisory panel's recommendations in the face of opposition from pro-nuclear businesses and groups. Ministers did not endorse the 20-page national energy policy that was released by the Cabinet advisory panel Friday, though they offered a more vague endorsement of its goals. The advisory panel, responding to public demands for an end to nuclear power in Japan following last year's tsunami-triggered meltdowns, called on Japan to give up nuclear energy within three decades through greater reliance on renewable energy, more conservation and sustainable use of fossil fuels. The Cabinet said only that it would take the policy document "into consideration" and would seek public support for the goal. But the public in this case includes not only the general public, which has come out strongly against nuclear power, but also the nuclear industry and other business interests, as well as communities near nuclear plants that rely on them economically. National Policy Minister Motohisa Furukawa said the gist of Japan's energy policy remains to phase out nuclear power, though it would take time to work out the details. Furukawa vowed to push for green energy and to seek to curb carbon dioxide emissions. The Cabinet's ambiguous endorsement has invited criticism from some commentators that the policy revision may just be intended to win votes in elections expected within the next few months. Nuclear energy made up about a third of the country's electricity before the disaster at the Fukushima Dai-ichi plant, and Japan had had plans to increase that ratio to 50 percent. Now nuclear power is highly unpopular, and only two of the country's 50 functioning reactions are on line while the government addresses public concerns about safety. Japan launched a new nuclear oversight agency Wednesday, following criticism that collusion between regulators and plant operators contributed to the meltdowns. Officials said the five-member Nuclear Regulation Authority, headed by nuclear physicist Shunichi Tanaka, was inaugurated Wednesday after months of delay due to demands from opposition lawmakers for more dependency as well as opposition to appointees' pro-nuclear background. TOKYOâ"Japan and the U.S. reached agreement on deploying U.S. Osprey military aircraft in Japan, settling an issue that had been an irritant in their relations as both countries grapple with China. "We have confirmed the safety of the Osprey aircraft," Defense Minister Satoshi Morimoto said Wednesday. "Having rigorously confirmed its flight safety, which was a precondition for flights to take place, we have given the U.S. permission to start test flights." The V-22 Osprey is a hybrid, with tilting rotors that allow it to take off and land vertically like a helicopter but fly like a plane. The agreement, which follows a visit to Japan by U.S. Defense Secretary Leon Panetta, comes as Japan is embroiled in an increasingly heated territorial dispute with China over a set of uninhabited islands in the East China Sea. An MV-22 above Virginia; Washington and Tokyo have reached an agreement on deploying the aircraft in Japan. The U.S. is eager to deploy the Osprey to improve its ability to move troops and equipment by air, and project power in the region. "Secretary Panetta has placed a high priority on reaching this agreement, directed numerous senior officials at the Department of Defense to work on this issue over the past several months and raised the issue in multiple discussions with Foreign Minister (Koichiro) Gemba and Defense Minister Morimoto, including earlier this week," Pentagon Press Secretary George Little said in a statement from Beijing, where he is accompanying Mr. Panetta on his Asian trip. The deployment in Japan has become controversial due to safety concerns. An Osprey crash in Florida injured five people, while an accident in April in Morocco killed two. U.S. officials say the perception of safety problems isn't supported by the actual accident rate, which is lower than for other aircraft. 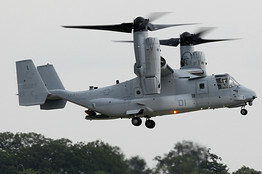 The U.S. Marines, who will be operating the Osprey, are expected soon to begin test flights at an air base in Iwakuni, Yamaguchi Prefecture, where 12 of the aircraft have been grounded since their delivery from the U.S. in July. But the agreement between Tokyo and Washington is not expected to end opposition in the southern prefecture of Okinawa. Concerns over the aircraft have been exacerbated by their planned deployment at Okinawa's Futenma Air Stationeâ"the center of a 15-year stalemate over the realignment of U.S. forces. Tokyo has long tried to relocate the base within Okinawa, but local governments want the forces out of the prefecture completely. "As seen in past protests and demonstrations, the popular consensus against the Osprey deployment is firm," said a spokesman involved in U.S. base relations for the Okinawa prefectural government. Though supported by the government of Prime Minister Yoshihiko Noda, the Osprey deployment has encountered strong resistance from senior members of his ruling Democratic Party of Japan. Officials in a minority party allied with the DPJ and in opposition parties also have expressed doubts about Tokyo's acceptance of Washington's deployment timetable. The aircraft have been battle-tested in Afghanistan and Iraq, and the U.S. says that they can fly nearly twice as fast as the CH-46 helicopter they will replace, with much larger payloads and flying distances between fuelings. â"Julian Barnes and Chester Dawson contributed to this article. The United States and Japan have reached an agreement allowing the MV-22 Osprey military aircraft to begin flight operations in Japan, officials said Wednesday. The deal had been in question because of protests by Japanese citizens who feared the hybrid aircraft was not safe. The Pentagon said in a statement that U.S. Defense Secretary Leon Panetta was pleased with the agreement, which calls for the deployment of 12 of the aircraft to the southwestern island of Okinawa. Japan's defense minister, Satoshi Morimoto, said Tokyo was satisfied the aircraft â" which takes off and lands like a helicopter but can fly like a plane â" was safe, but Okinawa's Gov. Hirokazu Nakaima said he remained concerned and called the government's handling of the matter "insincere." The Pentagon called the agreement the result of "a deep partnership" and a thorough process that has reconfirmed the safety of the aircraft, which U.S. officials say will help strengthen their ability to defend Japan and provide humanitarian assistance. Japanese media reports said test flights could begin this week at the base in southern Japan where the Ospreys are temporarily stationed before they fly to Okinawa. The plan has created an outpouring of anger on Okinawa after crashes in Morocco and Florida earlier this year. A recent incident in North Carolina that officials called a "precautionary landing" further aggravated the sentiment. 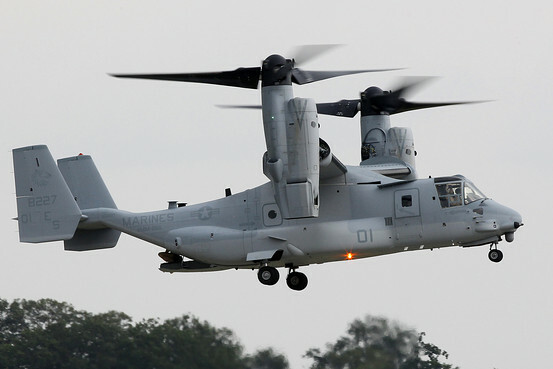 The tilt-rotor planes have been used extensively in Iraq and Afghanistan. The United States says they have a solid record and can fly faster and carry bigger loads than the CH-46, which it is replacing worldwide. But Okinawa officials say crowding on their islands means a crash could cause significant civilian casualties or damage. The deployment plan has also reignited longstanding anger over the heavy presence of American troops on Okinawa, where more than half of the roughly 50,000 U.S. troops stationed throughout Japan are based. Okinawans are also angry because the Ospreys will be deployed to Marine Corps Air Station Futenma, which the two countries decided to close more than a decade ago. The base has remained in operation because a replacement site hasn't been readied. Tens of thousands of Okinawans rallied against the plan in a peaceful protest earlier this month.